We’d love your help. 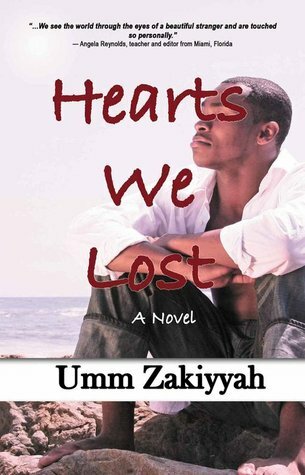 Let us know what’s wrong with this preview of Hearts We Lost by Umm Zakiyyah. To ask other readers questions about Hearts We Lost, please sign up. This is the very first English Islamic fiction book I read. I used to read Arabic Islamic fiction books when I was a teenager and I must say I missed the spirituality it gave me while reading them. Hearts We Lost, is a very interesting novel. I literally couldn't put the book down until I was done with it. I find it very captivating to see Islam through the eyes of a non-Arab Muslim. I had the pleasure of meeting Umm Zakiyyah a couple of years ago at a friend's house. I enjoyed the talk she pres This is the very first English Islamic fiction book I read. I used to read Arabic Islamic fiction books when I was a teenager and I must say I missed the spirituality it gave me while reading them. Hearts We Lost, is a very interesting novel. I literally couldn't put the book down until I was done with it. I find it very captivating to see Islam through the eyes of a non-Arab Muslim. I had the pleasure of meeting Umm Zakiyyah a couple of years ago at a friend's house. I enjoyed the talk she presented which led me to look for her books at the book store. Unfortunately, I didn't find them until a colleague at work gave me Hearts We Lost a couple of weeks ago at work and asked me to read it as she felt that I might like it as she did. Umm Zakiyyah, has a very unique way of writing, here words kept me thinking a lot and reflecting on the events that happened to Sharif-the lead character in the novel. Islam is in the heart, this way of thinking changed so many things in how Muslims practiced Islam nowadays. I'm guilty of using this phrase a lot. I never imagined that I would change the way I look at things after reading this book. Islam is indeed in the heart and Allah knows our intention, yet we still have to show our submission to him through our actions and words. She portrayed Muslims nowadays in a way that made relate to the characters in the book on so many levels. It was amazing ..simple yet thought provoking and heart gripping. Apart from being SLIGHTLTY bored towards the end and one or two thoughts I didn't fully agree with,this was really life changing. its beautiful to know that there are people out there who write in such moderation and who makes you wanna yearn for a pure-sin free love for yourself, your God and for others around you. It provokes your interest in mostly unknown and nearly abandoned principles of Islam like dream interpretation and R It was amazing ..simple yet thought provoking and heart gripping. Apart from being SLIGHTLTY bored towards the end and one or two thoughts I didn't fully agree with,this was really life changing. its beautiful to know that there are people out there who write in such moderation and who makes you wanna yearn for a pure-sin free love for yourself, your God and for others around you. It provokes your interest in mostly unknown and nearly abandoned principles of Islam like dream interpretation and Ruqyah- which sadly some view as superstitions or myths. This really was a great book, it's hard to pin point what I loved most about. For one its superbly written, once you get into the story you just can't help but feel what the characters are going through or admonish them when they're making mistakes. I never shed tears for books or movies, but there were actually a few moments while reading that I nearly had tears coming down my face. Another thing I loved was that as a Muslim I could relate to certain situations and every once in a while the cha This really was a great book, it's hard to pin point what I loved most about. For one its superbly written, once you get into the story you just can't help but feel what the characters are going through or admonish them when they're making mistakes. I never shed tears for books or movies, but there were actually a few moments while reading that I nearly had tears coming down my face. In this story I have met many people and I can understand their feelings very well…in each page I can see how their feelings and thoughts are really so different and very complicated… while I was reading I wished I can be faster than light to see what will happen next! In the end of the story I felt that all of the feelings were melted in one perfect end. A more accurate rating would be 3 1/2 stars. I'm not quite sure what I expected from this book, but what I read was a surprise all the same. The book is a fiction story, and you do get a novel (i.e. with characters, a plot line, and ending, etc.). And to be fair, the characters are well developed, believable and the story line is good too. But the author clearly wrote the book with the intention of passing along her ideas of teaching how Islam should be practiced today, and using the story withi A more accurate rating would be 3 1/2 stars. I'm not quite sure what I expected from this book, but what I read was a surprise all the same. The book is a fiction story, and you do get a novel (i.e. with characters, a plot line, and ending, etc.). And to be fair, the characters are well developed, believable and the story line is good too. But the author clearly wrote the book with the intention of passing along her ideas of teaching how Islam should be practiced today, and using the story within this book to preach these ideas. This is not a novel that you are supposed to read for enjoyment. It's a novel designed by the author to bring Muslims back on "the Straight Path." And to simply summarize what the author argues in the book is "the Straight Path" (in her opinion) would be to say: Islam is indeed in the heart and Allah knows our intention, yet we still have to show our submission to him through our actions and words. I don't think the author sacrificed the story by adding in (constant?) preaching of this message throughout the book. The story and the Islamic teachings are meshed together well. I do think it you pick up this book to read, you should know what you're in for --i.e. it's not a nice, relaxing story that just happens to have Muslims as the main characters in the story, engaging in appropriate Islamic behavior (i.e. a nice Islamic-friendly novel for Muslim teenagers). The author has a purpose in writing this book to spread what she considers her version of Islam. Which I don't necessarily disagree with, although I don't agree with all of her points in the book. I would not recommend this book for non-Muslims. There are constant Arabic and Islamic phrases that are not explained to those unfamiliar with them. Also, I think the author delves into cross-cultural and inter-religious issues that are familiar to those within the Muslim community, but to someone NEW to them, they might prove confusing. I did, however, like the book. I generally liked the story. The book was different than anything I had ever read before, and that's saying a lot. So, here's the thing: being a writer and editor kind of ruins some reading experiences. This was the case for me when reading this book. Whilst I couldn't put it down because of the truly gripping storyline, I was also distracted by the big chunks (sometimes pages) I would have removed. With a beautiful and symbolic story such as this, countless pages of characters' repetitive thoughts were unnecessary. For example, there were 3 whole pages of Sharif contemplating the topic for his khutbah and t So, here's the thing: being a writer and editor kind of ruins some reading experiences. This was the case for me when reading this book. Whilst I couldn't put it down because of the truly gripping storyline, I was also distracted by the big chunks (sometimes pages) I would have removed. With a beautiful and symbolic story such as this, countless pages of characters' repetitive thoughts were unnecessary. For example, there were 3 whole pages of Sharif contemplating the topic for his khutbah and the relevance it had to the society around him. Yet, with the khutbah closely following, it rendered those 3 pages rather redundant. I felt this was a problem that came up throughout the book; it was almost as if everything was being explained to me, just in case I didn't understand. Except the things that I really did want more information on: Hasna's true feelings for Sharif (at least what she internally claimed to be true) seemed to contradict quite drastically. There was even a time when I believed SHE had been affected by sihr, if only to account for her constant to-ing and fro-ing. Wow, I just loved this book. It made me think about so many things, and I love Umm Zakiyyah's writing...and this book was certainly not only the best of her books in my opinion, but my favorite book ever. The characters are so realistic and this book made me cry, sob, laugh, giggle..but most of all, ponder so deeply. And that's why I love it. I feel like I'm not the same person I was when starting the book--and that's saying a lot. In short, it's really amazing, no doubt. One of those books that makes you cry and wonder and weep and wonder some more. Excellent experience reading this after leaving If I Should Speak 7 years ago. I am marveled at home simple yet deep the discussions are. A MUST MUST MUST read.